Hey everyone. We are back talking about more failed Volkswagen parts. 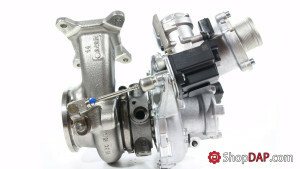 Today we look at how VW turbochargers fail. I have been trying to get my hands on a bad turbo for a long time. This one is extra cool because it is a bad turbo from a MK7 GTI! Trouble Viewing? Watch “How VW Turbochargers Fail ~ Video” on YouTube. By the way how is the cabriolet project doing, I will be glad when their is decent paint on it. 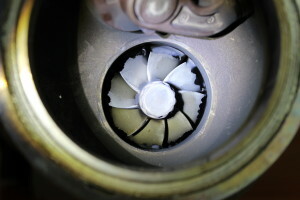 Why did you not explain what caused this turbo to fail so quickly? Because I could not pinpoint the exact failure. This is often times the case. We can’t always identify the reason. Multiple things, but if you want to know what the major contributor was. It was overheating of an already worn turbine blade/side, you probbably not understand so i would suggest you find a detailed parts diagram and watxh videos on how they work. If one thing one a turbo is not sufficient everything else fails too. 2 things, the first being the turbo not boosting, I have checked all piping related to the turbine system on your video you explained the basic cycle i have wondered whether the intercooler could cause a lag or no boost as it collects a small amount of oil with the a much thinner 5w40 oil but not with a 20w50 the question is with everything working or connected correctly could the car have a limp mode making the n75 malfunction or not engage? And then also could low all pressure cause the turbo not to boost at all, my problem is the cam change tensioner not tensioning and with a result between 1 – 2 rpms my car has a lazy cam change and you can hear the chain beating against the head in its chamber as it is not being tensioned. Could the oil pressure be causing both the tensioner and the turbo to malfunction is the real question I suppose. I repacked the engine, new pistons, rings, new piping, new seals everywhere, new splash plate/oil catch in the sump, new oil pump but not a new oil pick up, new oil filter. With thinner oil. In warm weather if I push the car I get a oilcompression engine stop indicator whereas in cold weather it does not engage. With a thicker oil like 20w50 it takes a lot more for me to get oil compression alarms..in fact it took me 250 km of continuous driving at 3rpm to get an alert like that. After changing every nook and cranny in the engine and still getting low oil pressure with no oil leaks what can I do and once again is this low oil pressure the cause of my new cam tensioner and turbo now functioning?